Are you facing problem with remembering different passwords for the different website? Or are you solving that problem with an old step setting the same password for every website? Well. The new version of that old step has come to let you be tension free of remembering different passwords for different websites. That is LastPass. You have to set only a Master keyword and that password will secure all the other passwords. So, why being late? Let's discover this Password manager. Why Using a Secure Password Manager is Important? In this modern era, with the welfare of the web developer, risk of cyber threat is also increasing at a suspicious rate. In your device, you may connect yourself with the different server with the different Passwords and ID. To minimize the risk of cyber threat, you should use different passwords. So, what is the next? Do you want to remember all these different passwords or to remember only a single password that will protect all the other different password? What do you prefer most? Obviously, the second one- remembering the single password. Yes, that's a password manager do. A password manager will secure your every single necessary password in your device. LastPass do this with a guarantee and render some other special function too. Simply to say, LastPass works as a volt that stores your password and ensures safety. It will manage all your password for free. LastPass free version is available for anyone. Also, it has the premium version. You can also use a web extension for Chrome, Microsoft Edge, Opera, Firefox, and Safari. But with the premium version, you can save sensitive data also like your bank account information. LastPass works with a master password and with that password you can save all the different passwords. One of their recent advantages is that you can also share your password with anyone without revealing the password so that the person can access but won't be able to know the password. >>>>> Apple iOS user can Get solution for iCloud security Code Problem. Whatever, it is so popular among the people. It has been rewarded as Editors choice by PC Magazine in 2009. A report came in 2017 and in that report Lastpass was one of the four popular password managers. It is normal to have the curiosity to know how you will get benefit from a service. Let's have a look at them. It will work as a volt for your each and every password. It will also save your sensitive data. It will let you share your password with anyone without revealing the password. Automatic form filling service is also available. You will have to remember only the master password. Provides a detailed report about each and every password which has been saved. It will also help you to increase the strength of your password by giving you hint. It can test and will tell you about the strength of your password. LastPass will also inform you to change your master password if something happens wrong. 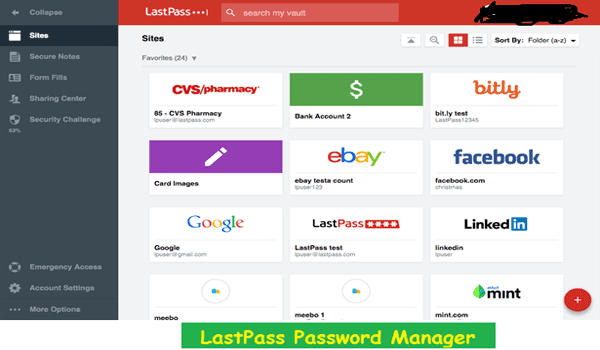 >>>>>>> Want to know more of alternatives Password manager Like Lastpass? Are you thinking about how to use LastPass? Are you facing problems? Don't worry we have included here a brief explanation of bite-size chunks. Let's have a look at the step-by-step process. At first, you have to download the LastPass as an extension to your preferred browser. You will find the free version easily for LastPass download. Now, install by simply following the provided instructions by LastPass. After installing the LastPass, allow it to add an add-on to your browser. Now, create a LastPass account. Give your email address and a strong master password for LastPass sign in. Remember that password will protect your other passwords. Now, it is time to save the passwords of other websites in the LastPass. When you will go to a new website, you will find the icon of LastPass beside the password button. After entering the password, click that icon and save that password. The password will automatically pop up when you will re-enter into that website. Fix your passwords with the security challenge features of LastPass. In ‘My vault' option you will find security challenge. Open that tab and enter your password. Go for my score and analyze the password. When to saving the information, you can go to add form fills and there you can save your information. There is a premium version of LastPass. You may ask about the extra service that you will get in the premium version. Let’s see them. You can share your password with many. You can access in your emergency. There is an advance multifactor function. File storage like 1 GB. Last of all, all the options available in the free version. Start your chrome. Go to LastPass extension. Then click on the manage extension. Check the Developer mode if it has not been checked already. Now, go to background HTML. Get the console log by clicking the show console button. Then copy that to the support ticket. Hopefully, your problem will solve with this solution. Go to tools in the firefox and the web developer. Then if you don’t find anything related to LastPass, attach the support to any error. LastPass hacked- what can I do now? Your account will be temporarily disabled if any unwanted malware or hackers hack your password. You will have to go to LastPass site and there you will find a page named ‘Unlock your LastPass account. Use the device that is familiar to LastPass. Enter the email and quickly change the password when you will get access. Therefore, you know about everything related to LastPass now. So, what are you waiting for? Download today your LastPass extension and enjoy your web surfing with only a Single password!